The Swarovski 2010 Ornament is a beautiful crystal design. Most Swarovski collectors will tell you that Swarovski ornament designs are similar in nature to stars or snowflakes. Oftentimes, Swarovski collectors refer to the annual edition ornaments as Swarovski star ornaments or Swarovski snowflake ornaments. The crystal ornament design has been consistent for decades. For each year, the ornament year is inscribed in a metal tag attached to the ornament. The ornament is hung by a colored ribbon. The Swarovski ornaments have 6 to 12 crystal extensions creating an elegant and unique look that simply sparkles in the light. The packaging for the crystal ornaments is a triangular box, with paperwork included that is specific to the ornament year. Swarovski has produced annual edition star / snowflake ornaments since 1991. Since then, Swarovski has also made some other annual edition ornaments. Swarovski produced angels under the Crystal Moments line (1996 – 1999). Swarovski produced heart ornaments 2004 – 2007. And Swarovski has done some ‘kris bear’ ornaments (2006 – 2009) that feature a teddy-bear-like design. Since 2003, Swarovski has produced “little stars” and “little snowflakes” to complement the annual edition star / snowflake ornaments. 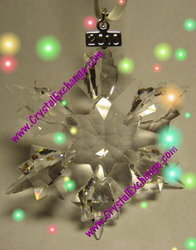 Many of the retired Swarovski ornaments can be found at Crystal Exchange America’s web site: http://www.CrystalExchange.com . In general, prices are most attractive during the summer months and pre-holiday time period. During and after the holidays, ornaments have mishaps, and collectors are likely to re-purchase them quickly which leads to difficulties locating replacements and temporary stronger prices. Crystal Exchange America can be found by visiting their website which has been available for over 15 years... a testament to their quality and success in the crystal industry. Presently, they have over 5000 products in their online store, most of which is retired Swarovski. For the avid crystal collector looking for more than the Swarovski figurines, Crystal Exchange America also sells the most popular books on Swarovski Crystal. Two of the collectors’ favorite Swarovski price guides are written and published by Swarovski collectors for the past eighteen consecutive years: Warner’s Blue Ribbon Books on Swarovski.